My mom used to have her own business. She monogrammed names and logos and anything else you wanted onto shirts, flags, baseball hats. A big chunk of her business came from bowling leagues. She’d sit down at her sewing machine with a stack of bowling shirts and spools of thread and stitch all the names: Joe, Roger, Barbara. I’m writing a one-man play right now. Sometimes when I’m writing I put on music. Usually it helps distract my mind so that I just focus instead of thinking too hard. Though sometimes it just distracts me. Just now I got distracted because a song I didn’t recognize came on by a singer I did recognize. Then the music video intrigued me. It features three and a half minutes of middle aged and older women bowling. They all take it seriously. They all look so focused. And then they all react to their performances, in simple but captivatingly honest ways. Perhaps you’re right, zestytoaster. Perhaps you’re right. Also confusing is that this opportunity is listed as a “Sarah Palin Economic Initiative.” It’s so ridiculous that I’m afraid it might be for real. Does anyone know anything about this? 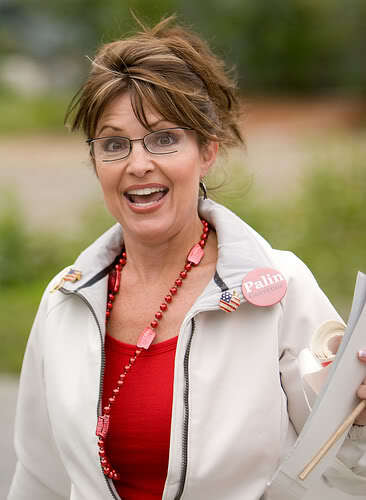 Is Sarah Palin funding a bizarre toy workshop in Northpole, Alaska? Oh, screw it. Let’s look at her!